This dialog allows you to create Records for files you have yet to create or expect to be sent to you. The process is described in the manual page 19. This function is especially useful when working with Custom Field information as the latter can be worked on in a Placeholder Record as easy as a normal Record. A good example of this might be a project to scan in an archive of material. The scanning might take some while to do but you can decide early on the eventual filenames of the scans. Now, whilst the scanning is going on you can now create Placeholders and work on the rest of the Record's information without having to wait for the scans to be available. When the latter are finished, update the Placeholders and all is done. Time saved! 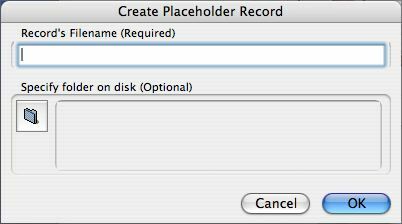 If you name the file correctly and know where it will be placed when available, then the Placeholder can easily be converted to a full normal Record by updating it. If Portfolio can't find the file, then an Open File dialog is displayed to allow you to find the file and allow Portfolio to correct its path data. The third case is where you got the name wrong in the Placeholder, and wish to change the name but maintain the other Record information (e.g. custom data). In this case use the Item menu's 'Link to a New File' function. Note for Windows users. When specifying a filename you must give both name and extension, e.g. "mypic.tif" not "mypic". In the latter case the file "mypic.tif" will not be used for an update and you will need to use the 'Link to a New File' method to re-connect Record and file. Note this use of name and extension differs from name handling in other parts of the program, e.g. renaming originals, where you can only work on the name but not the extension.